 I've stopped updating this website, though it's pages will remain for a while. See "current update" for details. 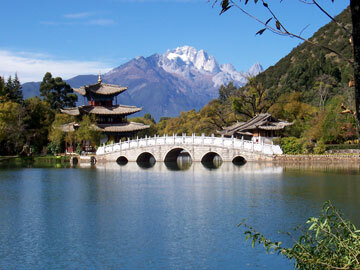 One of the best-known scenic places in Yunnan Province is Lijiang. We visited Lijiang (on business) many times, but most of these photos are from the overnight trip Vivian and Michael took in October 2006. Lijiang (which I'm writing as "Li-jiang" for the sake of foreigners) is about six hours from Kunming by bus, but Vivian and Michael are frequently on a tight schedule so we normally fly from Kunming (in less than an hour). I believe there is also a train available now, and that is probably a pretty trip. As this photo shows, Li-jiang is a UN World Heritage Site. 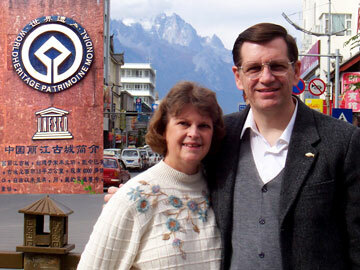 Yu-long Jade Mountain is behind Michael and Vivian during our first trip, in 2006. Vivian snapped this gorgeous shot of Yu-long Jade Mountain in a beautiful park in Li-jiang. Click here to see this and other free wallpaper! (Above) This 2006 montage shows part of the old town (World Heritage Site). There are lots of tourists (like Vivian and our friends, but mostly from China), and the shops are stocked accordingly with handicrafts, scarves, jewelry and similar things. The small photo shows some locals showing off their beautiful falcons. The city is lovely, and well worth a visit. Unfortunately, the most beautiful attraction (the Yu-long Jade Mountain) is rarely visible. We have only seen it a few times in our many trips to Li-jiang. This is one of the few remaining statues of Chairman Mao that I know of (there were everywhere back in the 1980s). 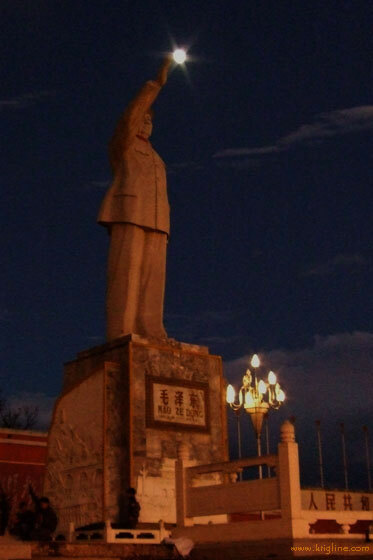 I like this photo--he was always reaching for the moon, and I often wonder what he would think of modern China. The signs above are outside a school in Li-jiang--I believe they were one of Mao's most famous sayings, roughly translated: "If you study well, you will make daily progress." 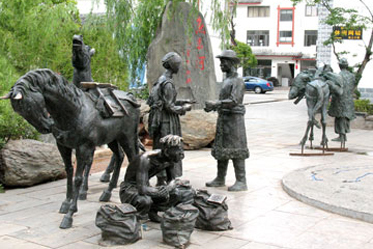 (Below) These statues commemorate the hardy merchants who brought tea, salt and other precious goods along the "Tea-Horse Road" (sometimes called the "Southern Silk Road"). But when we went to Li-jiang, we didn't really go as tourists--our main purpose centered on the needs of the Rainbow Homes of Hope--orphanages run by the Hong-Kong based Jian Hua Foundation in close cooperation with Yunnan's Civil Affairs Department. 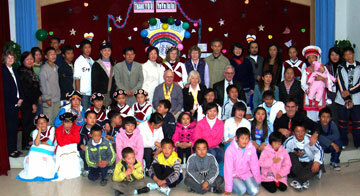 On our first trip (in October 2006, shown in the photos below) we attended a celebration honoring a retiring couple who had served as house parents for many years at one of the home-style orphanages. We enjoyed a banquet, then the kids did a wonderful job singing and dancing for all the guests. Below you can also see Vivian and some of the kids around the lunch table in one of the homes. 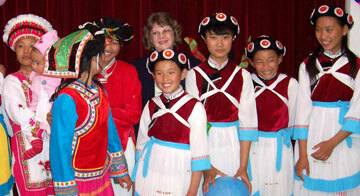 We were so impressed by everything we saw that we accepted an invitation to serve on the Board of Trustees for the JHF orphanages while we lived in Yunnan (in Li-jiang and Ning-lang). We enjoyed annual trips to beautiful Li-jiang, and we were glad to be playing a small part in helping these special children grow up in a loving environment. If you would like to know more about these kids and how you can help them, please visit the Jian Hua website, or write to us! Our email address is on the Home page. Click in the boxes below to go to some of our most popular pages. If you get lost, just click "Home."